Food diplomacy initiatives are increasingly being recognized as a successful means to open up peace dialogue as a result of our increasingly cosmopolitan palettes. Food is one of the oldest forms of exchange, with yet untapped recognition to deliver social conflict transformation. 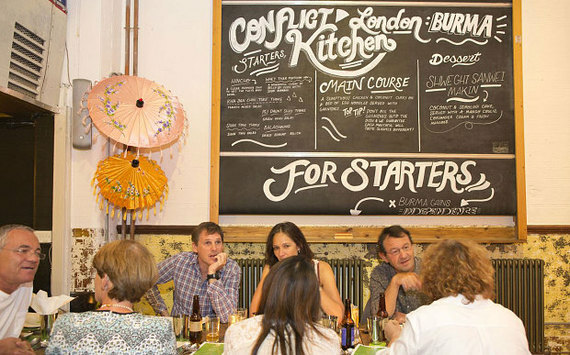 With this in mind, International Alert's Conflict Kitchen London opens up a new avenue to pursue peace dialogue by taking people on a tantalizing journey exploring new culinary experiences. With the renewed openness and organic quality that food elicits, Conflict Kitchen London can help promote better community engagement around the complex interchange of cultures, religions and ethnicities in one of the most multicultural cities of the world. Food is a natural convener of people, and the favorite place for discussion is where food is made and served, the kitchen. Yet, rarely do people have conversations about the food they eat, where the ingredients have come from, the detailed preparation it may have needed or the politics behind cuisines. Food and the kitchen are often under-utilized avenues for cultivating peace dialogue within our own community. To this end, International Alert has opened a pop-up Conflict Kitchen during its Talking Peace Festival to mark International Peace Day 21st September. Conflict Kitchen London, in collaboration with London pop-up network, Grub Club, and Monikers Restaurant, has been serving dishes from Burma, Jordan and Peru. On the table for discussion includes Burma's struggle to achieve civilian democracy during its political transition after decades of military rule; Jordan's geopolitical hotspot in the Middle East as the destination for refugees from Israel, Syria and Iraq; and the impact of illegal gold mining on Peru's indigenous people. These countries are often not on our radar for political discussion and even less is known about their national cuisines. Conflict Kitchen has taken the opportunity to initiate conversations about these countries and their food. The globalized market has enabled food from all areas of the globe into our homes and by doing so access to other cultures. By acknowledging the shared space we live in, all people can be included in the exchanges and interactions of another's cultural community, helping to reduce stereotypes and misinformed narratives of particular communities. London is one of the most multicultural capitals of the world, and it is this vibrancy and cross-section of cultures and ethnicities that provides the platform for open and frank discussions about other countries by thinking global, acting local. Conflict Kitchen London embodies this thinking for a better world through enhanced civil engagement using food as a medium. Indeed, a meta-analysis of 515 studies that was carried out by Thomas Pettigrew et al in 2011 found that "intergroup contact typically reduces prejudices." The increasing number of pop-up kitchens in the United States is certainly testament to this finding. Conflict Kitchen in Pittsburgh, America, is the brainchild of Jon Rubin and Dawn Weleski that seeks to stimulate political awareness by serving cuisines from Iran, Afghanistan, Venezuela and North Korea, all countries that the United States is in conflict with. Artist Michael Rakowitz created the Enemy Kitchen in 2007, using food to open critical dialogue around the war in Iraq. His project invited students and adults to cook and share a meal together, all of which was made using recipes from his Jew-Iraqi mother. The practice of eating together allows all sectors of the community to have an input in discussions, and as such becomes "a public act that enlists and audience as vital collaborators in the production of meaning (Rakowitz)." The idea of food as a connector of people and communities has been well recognized in many cultures. In Afghanistan, the saying "I have had water and salt in your home," means that through food eaten together "we are bonded to one another." Food is a powerful broker of peace and used as a source to resolve conflicts in many villages across Afghanistan. International Alert's Director of Emerging Programmes, Phil Champain, recognizes the power of food rituals as tools for conflict resolution. The practice of food rituals across the Middle East encourages forgiveness and reconciliation through sharing a meal between offender and victim, cooked and hosted by the perpetrators family. Community peace is created through musafaha (hand-shaking), and mumalaha (breaking bread together). Such practices underpin the idea behind Conflict Kitchen London. This is not to say that food is always a source of unity. As the infamous hummus wars between Lebanon and Israel indicate, food is equally a point of contention and competition for national legitimacy. Food can pull communities apart as a result of the intense national narratives that they are often imbued with. Hummus embodies such division: in 2008, Lebanon entered the Guinness Book of Records by creating the world's largest hummus plate topped with the Lebanese flag to solidify its position as the original owner of the traditional dish. 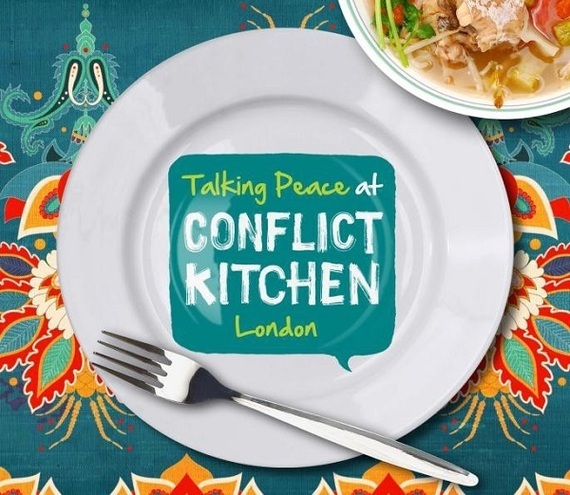 Projects like Conflict Kitchen London seek to overcome such hostilities between cultures, and move to collectively embrace food as a welcoming entry point to more comfortably discuss difficult topics of national and political significance. Therefore, the offer to share food is a gesture much deeper than is often realized. It is far from trivial or frivolous, as it may seem, after all food is a basic necessity and an everyday presence in our lives. Yet, national cuisines are flavored with history and seasoned with culture that is both fascinating and educational. It is one of the easiest routes towards galvanising cultural diplomacy, the "exchange of ideas, values, traditions and other aspects of culture or identity" (Institute of Cultural Diplomacy.) Conflict Kitchen London's invitation to share in the experiences of other's is effectively using food to open the door to national and international forms of cultural diplomacy. Diplomatic food actions make an important contribution towards peace dialogue. Food is a great story-telling device that encourages and inspires people to talk, engage and learn from other people's thoughts, history and experiences. People often feel uncomfortable talking about politics with strangers in public. Conflict Kitchen ensures that a safe space is created so that people are included in civil engagements around political discussions, not just to express themselves but to also learn from each other. During Burma Week, the kitchen, based in Hoxton Square in Hackney, was decorated with artwork by Syrian artist Tarek Tuma and Pure Evil produced for the Festival and large shared tables allowed for conversations to open with ease, with fact cards providing useful talking points. Burmese chef Debbie Riehl underlines the importance of the Conflict Kitchen London: "I am convinced that sharing a meal can be a vehicle for discussing important global issues that affect us all." By generating cultural inclusion and understanding through projects like Conflict Kitchen London, greater cross-cultural communication and engagement will help build bridges to other people's world view that is little known or understood. Instead of food being a point of division or competition, food needs to be seen as a commodity across the globe that unites people. The success of Conflict Kitchen London clearly shows the importance of food in bringing people together to find common ground. It also reminds us of the need to recognize and capitalize on the inherent diversity of food and cuisines as a staple of community cultural diplomacy. The project has certainly shown the truth in the saying: "The easiest way to win hearts and minds is through the stomach." This week is Peru Week.